Depends diapers have built-in odor protection. When it comes to managing incontinence in the right way, shielding yourself from odors is one of the most important things. Odor protection is important as it will allow you to feel confident when you are in public. Incontinence can lead to embarrassment and often forces many people to avoid social situations. Don’t let this happen to you! Choose the right adult diapers that will prevent you from public embarrassment. Depends diapers have built-in odor protection, allowing you to feel confident in yourself once again. The odor protection with Depends diapers can prevent others from being able to detect that you even suffer from incontinence. To find the best incontinence supplies it helps to know which form of incontinence you suffer from. The majority of people suffer from urinary incontinence. This is when you have the involuntarily loss of urine. For many people urinary incontinence will come on suddenly. You will not have warning that the bladder is going to release urine and you often will not be able to make it to the restroom in time. When this occurs, you should plan on wearing adult diapers through the day as they will capture the urine that is lost. There are also incontinence pads that can shield you from odors. These pads are great for light urine loss. The Depends pads can be discreetly placed in your regular underwear. For individuals that are embarrassed about incontinence, the pads can help you maintain your dignity since you can continue wearing your normal underwear. The pads do not make noise either when you walk around. One other benefit to the Depends pads is that they also include the odor shield. This will protect others from smelling urine if you do end up having an accident in public. 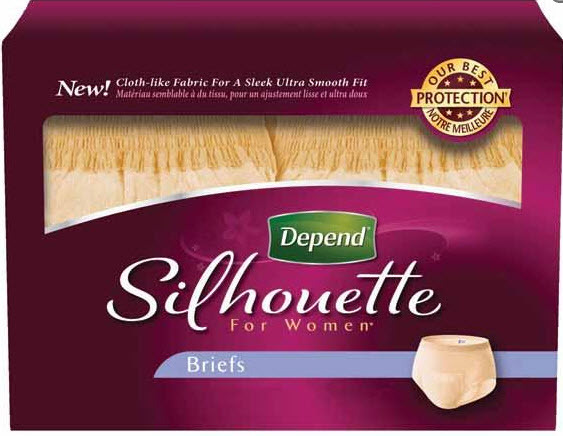 The Depends brand sells a large variety of incontinence products to choose from. Purchase incontinence products based on your gender. Though urinary incontinence is similar in both genders, the way the urine is released is different. Each gender needs a product that will capture the urine in the area where it is lost. Try out multiple Depends products to find the one that does absorb the urine properly and will give you maximum protection. Every incontinence product you use needs to not only absorb well but it needs to be comfortable. If the adult diaper is too tight on the skin it can end up leading to rashes and rubbing on the skin. The adult diapers are meant to be comfortable. Since they will be part of your lifestyle now, it helps to search for the products that do fit snugly but do not rub. Try moving up a size if the adult diapers are too tight around the legs. If they are too loose, they can lead to leaking. It helps to shop for incontinence supplies that are affordable. When you are wearing them daily, the disposable products can become expensive in a hurry. Opt for the products that you can afford. Washable incontinence products might suit your budget easier. Depends actually can help you here if you have a flex spending account. There are certain situations where insurance companies will pay for the supplies. How can you dispose of the adult diapers when you are in public? Using small plastic bags with odor shield or bags that are scented can prevent you from embarrassment. This way you can toss them into the trash without the worry that other people will smell them when they pass by the trash container. Managing incontinence doesn’t need to be an embarrassment anymore thanks to odor shield offered by Depends diapers!